Asphat batch mix plants are reliable machines for producing quality hot mix asphalt in batches. It is sturdy equipment designed for smooth operation even under rough conditions. The product quality is sturdy for rough Indian conditions. We feel proud to announce ourselves as the dependable organization engaged in offering Asphalt Batch Mix Plant that is comes with feeding unit & counter flow drying drum. 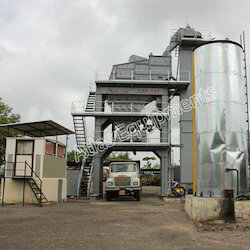 This batching plant is design for rough Indian applications and offered batch mix plant is manufactured using the highest grade basic material and advance technology. We offer this batch mix plant in numerous stipulations and can be customized as per the needs of the patrons. 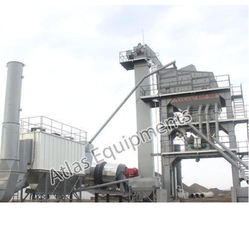 Asphalt batch plant by Atlas is offered in two types stationary and semi-mobile. Stationary plants are for those customers who desire high volumes of production at a single place. But in case you intend to move frequently you can also opt for semi-mobile type equipment where all the components except the tower unit are mobile. The design of this asphalt batch mix plant is in such a way that it is easy to install and fast to disantle. All the units are modular which makes it easy to transport thereby saving a lot of money in the transportation costs. PLC type touch screen panel with user friendly software. Low cost of spare parts. 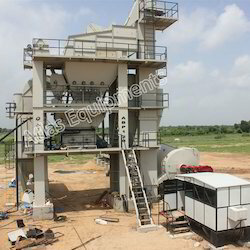 Atlas is India based manufacturer of asphalt batch mixer plants. These road construction machines are designed keeping in mind your needs and requirements. The sturdy and strong design is build to withstand rough applications. This plant featured here is installed near Ahmedabad, India. This asphalt batch mix plant is equipped with natural gas burner and uses CNG fuel for drying drum and also for hot oil heater. Usually the batch mixers that we supply come with multi fuel burner which is compatible with diesel, FO or LDO. Customised needs of this customer enabled us to develop natural gas burner for them. Asphalt batch mixers by Atlas are for making quality hot mix asphalt in batches. It is possible to store and edit the mix recipes and make the plant run as per your requirement. This hot mix plant makes hot mix asphalt in batches. It is one of the most economical and easy to use equipment available in the market today. The mixing unit is maintenance free twin shaft mixer that helps in better mixing in short time. The liner plates used in the mixing unit are replaceable. All the components are designed in such a way that you can use this equipment for years to come. 35 years of experience in manufacturing construction equipment. 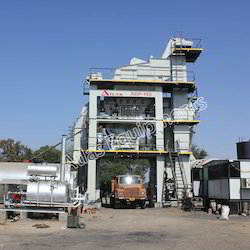 Looking for Asphalt batch mix plant ?